The largest genetic sequencing study of osteosarcoma to date has revealed that some patients with osteosarcoma could be helped by existing treatments. A team of researchers from the Wellcome Trust Sanger Institute, University College London Cancer Institute, and the Royal National Orthopedic Hospital NHS Trust, has found that 10% of patients with a genetic mutation—specifically, particular growth-factor-signaling genes—may benefit from IGF1R inhibitors. The results suggest a re-trial of IGF1R inhibitors for the subset of patients with osteosarcoma who are likely to respond based on their genetic profile, the researchers reported in Nature Communications (“Recurrent mutation of IGF signalling genes and distinct patterns of genomic rearrangement in osteosarcoma”). “We reveal a clear biological target for osteosarcoma that can be reached with existing drugs,” Sam Behjati, Ph.D., first author from the Wellcome Trust Sanger Institute and University of Cambridge. In the study, investigators analyzed the genome of 112 childhood and adult tumors—double the number of tumors studied previously. Scientists looked for mutations in the tumors to understand the mechanism of osteosarcoma development. The genetic information revealed a specific process for rearranging the chromosomes that results in several cancer-driving mutations at once. In 10% of cases, the team discovered cancer-causing mutations in insulin-like growth factor (IGF) signaling genes. IGF signaling plays a major role in bone growth and development during puberty. Researchers believe that IGF signaling is also implicated in the uncontrolled bone growth that is characteristic of osteosarcoma. Structural variants were identified as a major source of driver mutation. “We discovered a new process—chromothripsis amplification—in which the chromosome is shattered, multiplied, and rejigged to generate multiple cancer-driving mutations at the same time. We believe this is why we see very similar osteosarcoma tumors in children and adults, which are not the result of aging,” said Adrienne Flanagan, Ph.D., senior author from the Royal National Orthopedic Hospital NHS Trust and University College London Cancer Institute. IGF signaling genes are the target of IGF1R inhibitors. Past clinical trials of IGF1R inhibitors as a treatment for osteosarcoma yielded mixed results, although occasionally patients responded to therapy. IGF1R inhibitors have not been further tested in osteosarcoma, as it had been unclear which patients would benefit from the treatment. The current treatment for osteosarcoma is chemotherapy followed by surgery, where the bone tumors are removed. 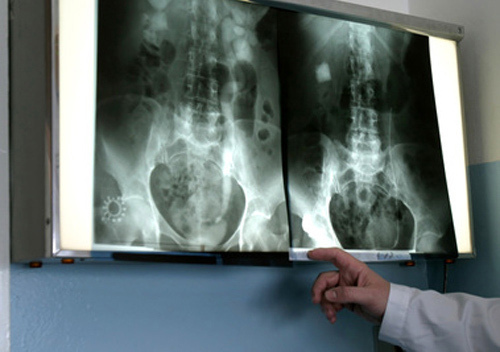 There has not been a new treatment for osteosarcoma in almost 40 years. Worse, no new osteosarcoma treatments appear on the horizon, notes Peter Campbell, M.D., Ph.D., lead author from the Wellcome Trust Sanger Institute.